One of the best ways to overcome disappointment delivered by the hand of someone else … is to bake cookies. Well, it worked on Sunday, for me. Combine it with the celebratory and magic-carpet-ride effects of flowers (and spices, and pistachio nuts, for that matter) and you have a most excellent close to your weekend. 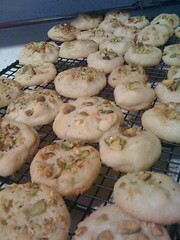 Pictured are the Pistachio-Rosewater Cookies that I made, from the Veganomicon cookbook. Recipe is here, but do investigate this entertaining, useful, and encouraging compendium of plant-based cooking. These treats are also useful on Mondays, if you are observing Meatless Monday in a vegan fashion, and want to share cookies with your yoga students.